A team led by researchers at Harvard University has produced the first untethered, autonomous, "soft" robot. 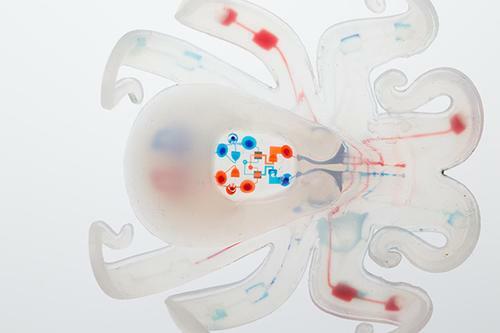 Dubbed "Octobot," because of its octopus-inspired design, the robot was created using a combination of 3D printing, molding, and soft lithography and has no rigid parts like a circuit board or battery. The researchers, who published their work in the journal, Nature, this month, hope their proof of concept will lay the foundation for a new generation of soft robots with the flexibility and dexterity to move and operate in tight spaces. Instead of rigid electronics, Octopod is powered by a hydrogen peroxide solution that reacts with platinum and produces gas, allowing the robot to move. Octobot is made of silicone polymers, poured into an octopus-shaped mold. As detailed in the Nature paper, the researchers used 3D printing to embed channels throughout the robot's body to allow for the flow of liquid fuel. "Instead of passing electrons around, we're passing liquids and gases," Robert Wood, the Charles River Professor of Engineering and Applied Sciences, and core faculty member at the Wyss Institute for Biologically Inspired Engineering at Harvard University, told Nature. Given that Octobot is not designed to perform any specific task and doesn't have any sort of programmable CPU, it really is a robot by only the broadest definition. Rather than electronics, the robot derives its power using microfluidics. A 50% hydrogen peroxide solution is injected into two reservoirs that are infused with platinum. The hydrogen peroxide reacts with the platinum, releasing pressurized gas throughout the channels (eventually passing out via exhaust vents), allowing the robot to extend it arms. According to the paper, 1 mL of fuel is enough to power Octobot for about eight minutes. Work Smarter, Not Harder. From machine learning to cognitive computing, robotics and automation are empowering decision making and business strategy development. Get the details in "Working Smarter, Not Harder: Human Collaboration with Robotics and Automation" at Design & Manufacturing. Sept. 21-22, 2016 in Minneapolis. Register here for the event, hosted by Design News’ parent company UBM. Interest in soft robots has been accelerating over the years. In 2012, for example, IEEE established a Technical Committee on Soft Robotics. And soft robotics technology was the inspiration behind the Baymax character in the 2014 animated Disney film, Big Hero 6. Octobot is not the first soft robot, but merely the first untethered one. The credit for the first soft robot with no hard components goes to OCTOPUS, a European Commission-funded project to develop an eight-armed, octopus-like robot capable of swimming and performing grasping tasks. Octobot itself has its origins as a DARPA-sponsored program. Back in 2012, under DARPA's Maximum Mobility and Manipulation (M3) program, Wyss Institute researchers developed a predecessor to Octobot. And last year researchers at Cornell University unveiled a 3D-printed robotic tentacle designed around a soft actuator (also inspired by the octopus). All of these previous systems were tethered to an external system both for power and control. Octobot demonstrates that it may be possible to someday develop soft robots that can perform sophisticated tasks autonomously. Octobot is also only the latest in a series of soft robotics advancements coming out of the Wyss Institute. Back in June, researchers from Wyss announced the development of vacuum-driven soft robotic actuators inspired by human muscle. According to the paper published in Nature, the next step for researchers will be to create more complex soft autonmous robots that can perform a variety of actions -- including movements like swimming and crawling, responding to their environment, and functioning beyond performing only pre-programmed routines. While no core use case has been identified for soft robots as of yet, advocates of soft robots believe they will someday have applications in various fields from construction to medical devices and environmental exploration.